Let’s take a case study of Supply Chain optimization. Now you have to maximize the Profit using PuLP library. Use decision variables, objective functions, and constraints. How much pizza of each type should we make in 30 days. Here you are defining the model using LpProblem function. The LpMaximize will look for maximizing the value i.e. Profit. If you want to get the minimum value from the model then use LpMinimize. We can use LpMinimize when we are talking about reducing the wastage. Here we define each Variable using LpVariable function. Lowbound refers to the lowest possible value of the variable. Pizza can not be negative so we have given the value 0, Upbound is the maximum value of the variable. The word “Supervised” means monitoring. A supervised learning algorithm is one in which you train a data set on output and then the model takes up these inputs and predicts the outcome. Confusing? You own a restaurant and you have collected various information about the customers like Name, Status, Job, Salary, Address, Home town, Food item they ordered, etc. Interestingly most of the work you will do in your Data Science job will revolve around Supervised Learning. Supervised learning is where you have input variables (x) and an output variable (Y) and you use an algorithm to learn the mapping function from the input to the output. 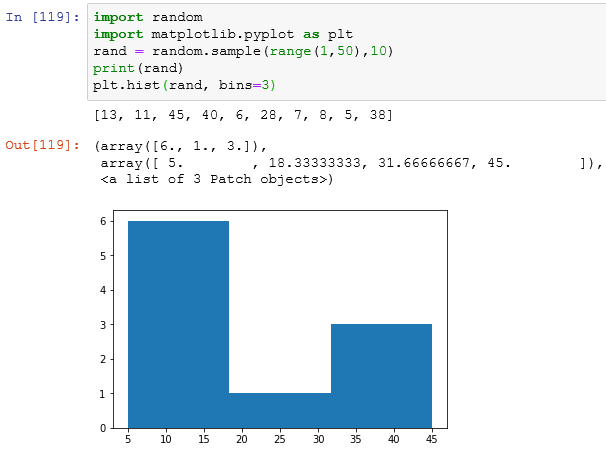 The goal is to approximate the mapping function so well that when you have new input data (x) that you can predict the output variables (Y) for that data. Step 3 – Feature Engineering. You might need to create or derive new features from the already present data set. The input object is transformed into a feature vector, which contains a number of features that are descriptive of the object. Step 5 – Run the model on the training data set. Some supervised learning algorithms require the user to determine certain control parameters. These parameters may be adjusted by optimizing performance on a subset (called a validation set) of the training set, or via cross-validation. b. Regression – Regression is used when you need to predict continuous values like Number of customers coming to a restaurant, the number of visitors on a website, etc. 6. In supervised learning for image processing, for example, an AI system might be provided with labeled pictures of vehicles in categories such as cars and trucks. After a sufficient amount of observation, the system should be able to distinguish between and categorize unlabeled images, at which time training can be said to be complete. Supervised Learning is like learning from a teacher. He will teach you the ways to answer questions and will evaluate your learning. You can expect the same types of questions to appear in the examination i.e. your testing condition. And you answer according to your understanding. Your marks is your accuracy. We will use Python to train our Supervised Learning algorithm in the next few Days. Day 30 – What is Machine Learning? Big Data, Machine Learning, Artificial Intelligence, etc. In 1990s the size of data used to be small and people used to store only relevant data points. With the World Wide Web(WWW) boom, data became omnipresent. There was a way to store a good amount of data in Excel files and other applications. But the major change happened with the advancement in mobile technologies. Smartphones came up with a lot of data. Every application and website is storing a plethora of data ranging from your personal to professional information. Almost all the clicks you make on the internet are being stored somewhere in the word. When you are working with a lot of data, then that data is termed as Big Data. So, it’s not like Big Data is a new concept. It’s just that the size of data increased multiple times and in order to store these data, we needed new tools and technologies. All this complete eco-system is called Big Data. Now, what is Machine Learning? Machine Learning is a way to train a machine to start learning from the user’s behavior and then provide useful information or take actions accordingly. You can see Machine Learning examples around you. 1. You click an advertisement on Google and the next day you get similar ads. This is because your interest was tagged in this brief span of time and now you are bombarded with the advertisements. 2. Ever heard of Driverless cars? Can you even imagine the rate at which the back-end algorithms need to work in order to identify an object and taking actions accordingly? The margin of error is almost zero because we are talking about real life. This is where image recognition and several different algorithms come into the picture. 4. 10 Years back Software Engineers used to work on these predictive models, clustering and classifying data, etc. But as the amount of data started increasing, handling data and getting insights from these data because difficult. This gave rise to new job opportunities which go by the name of Data Scientist, Data Analyst, Decision Scientist, Big Data Analyst, etc. 5. Most of the hard work for machine learning is data transformation. From reading the hype about new machine learning techniques, you might think that machine learning is mostly about selecting and tuning algorithms. The reality is more prosaic: most of your time and effort goes into data cleansing and feature engineering — that is, transforming raw features into features that better represent the signal in your data. 6. AI is not going to become self-aware, rise up, and destroy humanity. A surprising number of people seem to be getting their ideas about artificial intelligence from science fiction movies. We should be inspired by science fiction, but not so credulous that we mistake it for reality. There are enough real and present dangers to worry about, from consciously evil human beings to unconsciously biased machine learning models. So you can stop worrying about skynet and superintelligence . 7. ML is a computer science discipline that consists in making computers “learn” from data rather than programming instructions. For example, imagine you had to implement a gender (male vs female) recognition software. If you had to implement this in the traditional way, you would need to extract features that would help you decide. Then, you would write a lot of code to instruct the computer how to use these features. Unfortunately, this approach is tedious and not robust enough. On the other hand, the ML approach consists in collecting lots of images and labeling them. Then, running an ML algorithm that will learn the task by observing the data. By the way, this approach is called supervised learning. 8. ML is an evolving and exciting field. Many jobs exist and many more will. It is the modern form of literacy in our technological and data-driven society. Learn about it as much as you can. Go through all the overview Days in this challenge, pick up a few and then gain expertise in a couple of these. Author xtramous1Posted on April 15, 2019 April 15, 2019 Leave a comment on Day 30 – What is Machine Learning? 3. ANOVA -> It stands for Analysis of Variance. It is a statistical method used to test differences between two or more means. We will have a separated blog for all the tests separately. Till then google. This is a cheat sheet which aims on giving all the important concepts in a very crisp manner. Just give it a read before starting a new project in R or interviewing for a Data Science or Data Analyst or Business Analyst post. 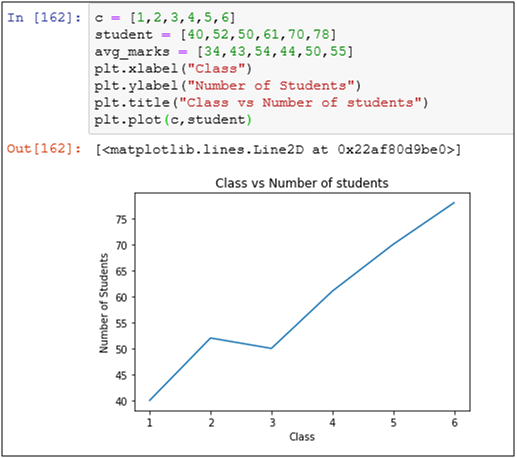 There are various advantages and disadvantages of using R over Python, but we will not dig deep into it. We will start directly with Data Types which are the building blocks of a programming language. 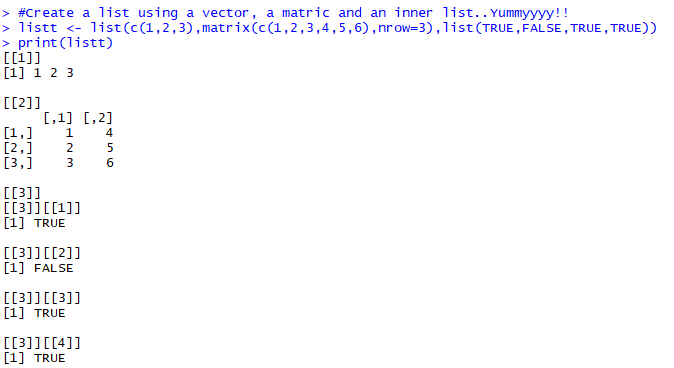 Let’s create a list which will include a list, a vector, and a matrix. 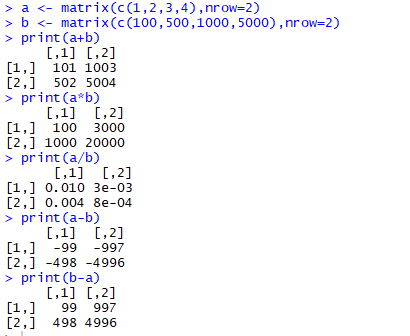 If you don’t know much about matrix, just remember it’s a 2-dimensional object which is defined as x<-matrix(c(1,2,3,4,5,6),nrow=2) to create a matrix with 2 rows. I think you must have got a gist of a matrix. You can definitely create two matrices and apply arithmetic operations like addition, subtraction, etc. 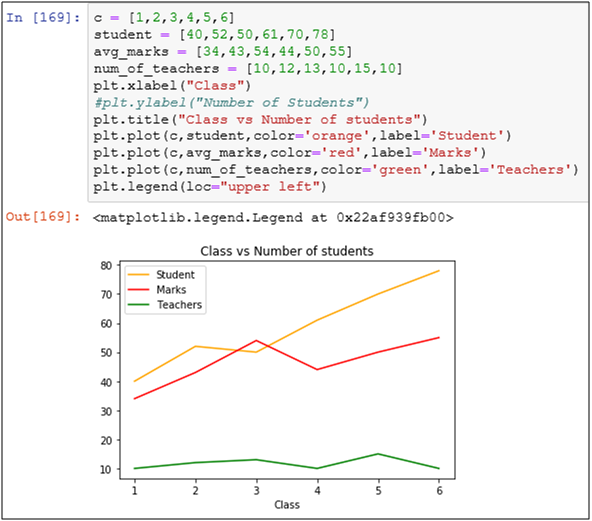 Day 29 – Visualization in Python cont. You already know how to add x-labels, y-labels, title, etc. 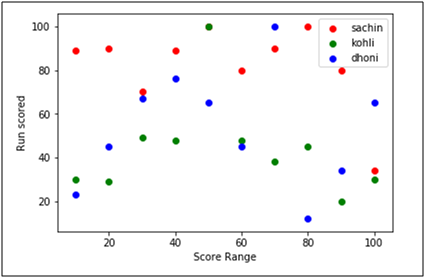 A box and whisker plot, or boxplot for short, is generally used to summarize the distribution of a data sample. 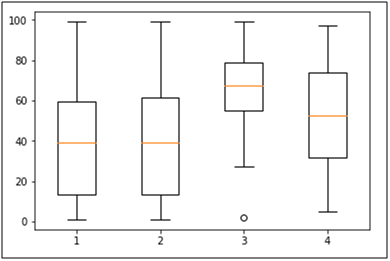 The x-axis is used to represent the data sample, where multiple boxplots can be drawn side by side on the x-axis if desired. 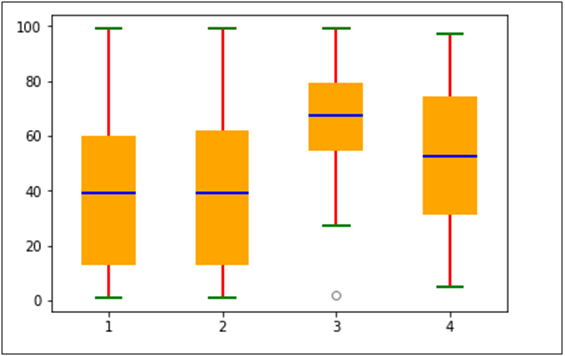 Box plot is one of the most common type of graphics. It gives a nice type of summary of one or more numeric variables. The line that divides the box in the two half is the median of the numbers. 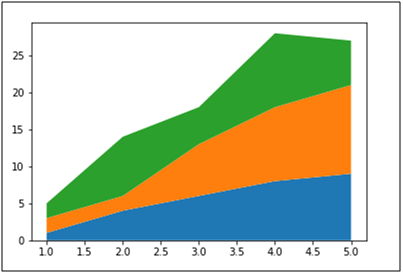 Now we will try to make the graph look better by adding color to the plot. 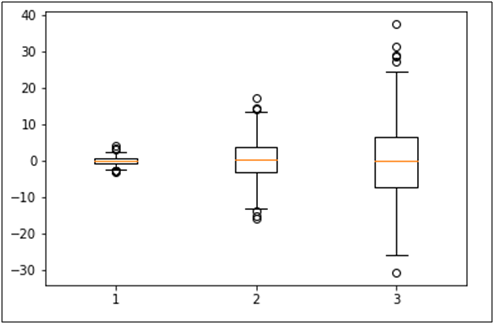 The box-plot shows median, 25th and 75th percentile, and outliers. 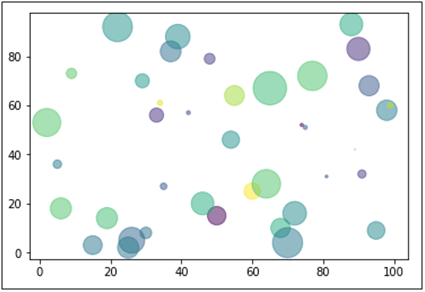 You should try to give different color to these points to make the plot more appealing. Following is the code with some fancy colors to help you understand each term individually. 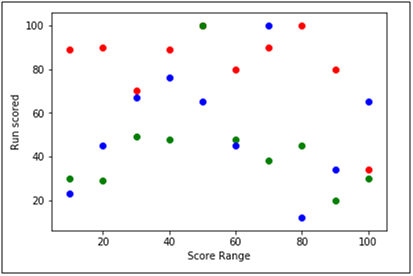 Scatter plot is an easy to make but interesting visualization which gives a clear picture of how the data is distributed. 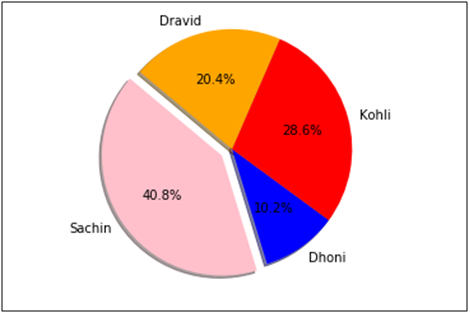 Create a pie chart for the number of centuries scored by Sachin, Dhoni, Dravid, and Kohli. xticks is used to give labels to the x-axis and yticks give labels to the y-axis. One of the most important thing is to understand when to use which graph and a list of all the graphs in your knowledge. 1. 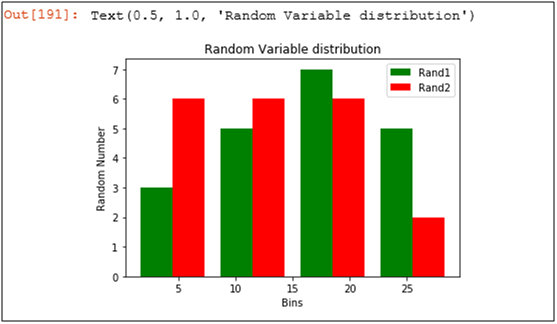 Distribution shows how diversely the data is distributed in your data set. How many people are from which state of the country? 4. Composition Charts – When you have to show a percentage or composition of variables. 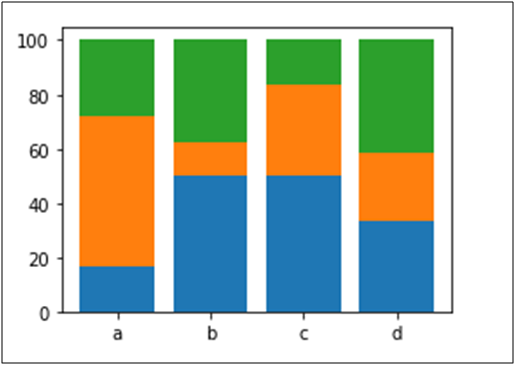 c. Stacked 100% bar chart – When you have to look into the contribution of each component. 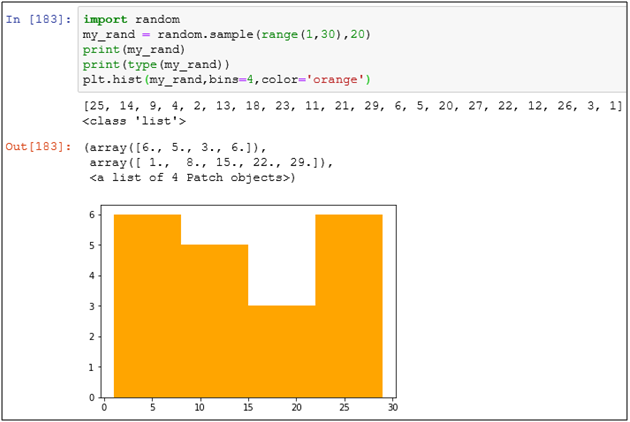 Author xtramous1Posted on April 1, 2019 April 8, 2019 Leave a comment on Day 29 – Visualization in Python cont. Data visualization is the discipline of trying to understand data by placing it in a visual context so that patterns, trends and correlations that might not otherwise be detected can be exposed. It is one of the basic but a very important weapon in your Data Science career. 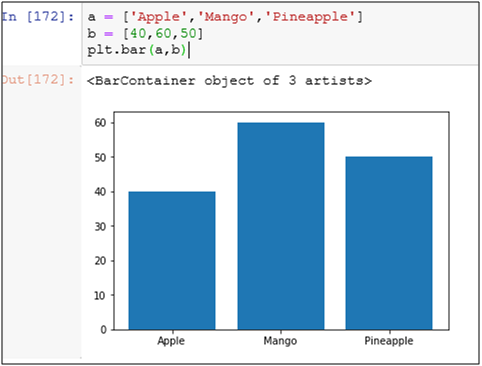 Python is blessed with some good libraries for visualizations. 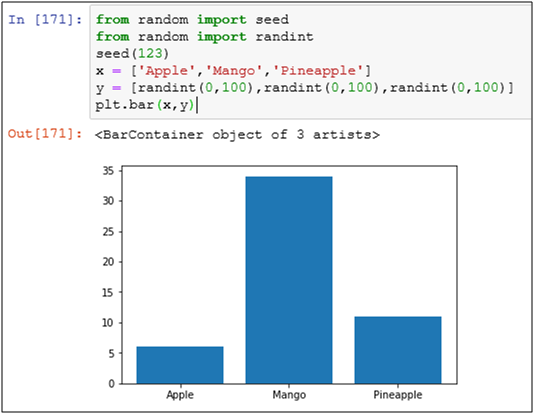 Open Jupyter notebook or any other IDE of your preference. 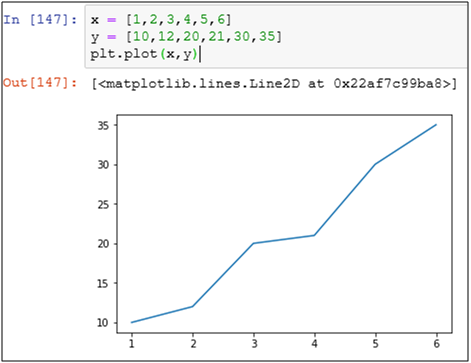 Library to use – There are a lots of good visualization libraries, but matplot library is the most preferred one to start with because of its simple implementation. 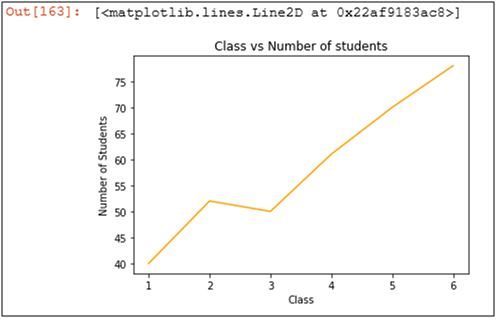 So,We will mostly concentrate on matplot library. Importing the library and giving it the standard alias as plt. 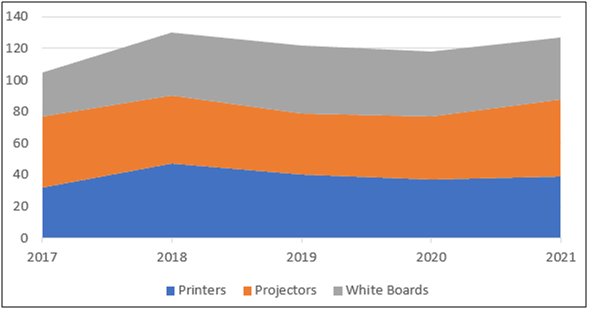 A line chart or line graph is a type of chart which displays information as a series of data points called ‘markers’ connected by straight line segments. So, a line plot is a very basic plot which is used to show observations collected after a regular interval. The x-axis represents the interval and the y-axis represents the values. Do you want to change the color of the line? 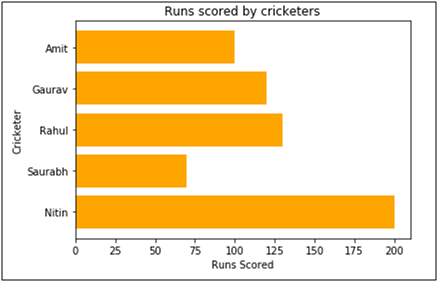 We will plot few graphs first and then you can put labels, title, and legends later. 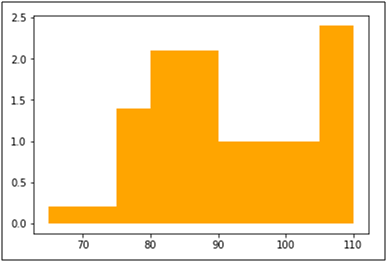 Use random values between 1 and 100 to create the same graph. 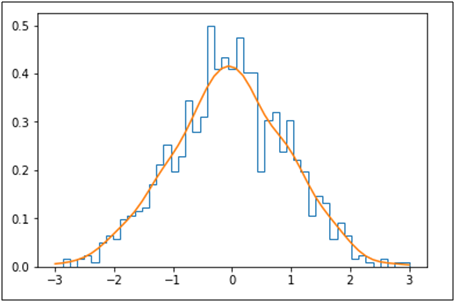 Histograms are density estimates. A density estimate gives a good impression of the distribution of the data. The idea is to locally represent the data density by counting the number of observations in a sequence of consecutive intervals (bins). 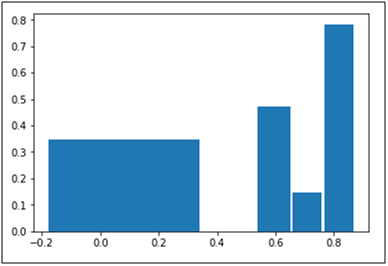 In Histogram also you can add more than one data points to make parallel bars. Keep making irrelevant and unnecessary graphs. You always have to read and write files when working for a company or Hackathon. So, it’s necessary to know how to read different types of files. The most important command to open a file in Python is the open() method. It takes two parameters, Name of the file and action mode. Comma Separated Values or CSV file format is one of the most used file formats and you will definitely come across reading a csv file often. If you need information about a specific file format, do comment below. 3. These are actual interview questions asked in companies like Myntra, Flipkart, BookMyShow, WNS, Sapient, etc. 4. You have to practice to become perfect. You can practice here or anywhere else. But make sure you know all the questions given below. 1. Which data type is mutable and ordered in Python? 2. Can a dictionary contain another dictionary? Yes, a dictionary can contain another dictionary. In fact, this is the main advantage of using dictionary data type. 3. When to use list, set or dictionaries in Python? A list keeps order, dict and set don’t: When you care about order, therefore, you must use list (if your choice of containers is limited to these three, of course;-). dict associates with each key a value, while list and set just contain values: very different use cases, obviously. set requires items to be hashable, list doesn’t: if you have non-hashable items, therefore, you cannot use set and must instead use list. 4. WAP where you first create an empty list and then add the elements. 5. What does this mean: *args, **kwargs? And why would we use it? We use *args when we aren’t sure how many arguments are going to be passed to a function, or if we want to pass a stored list or tuple of arguments to a function. **kwargsis used when we don’t know how many keyword arguments will be passed to a function, or it can be used to pass the values of a dictionary as keyword arguments. The identifiers args and kwargs are a convention, you could also use *bob and **billy but that would not be wise. 6. 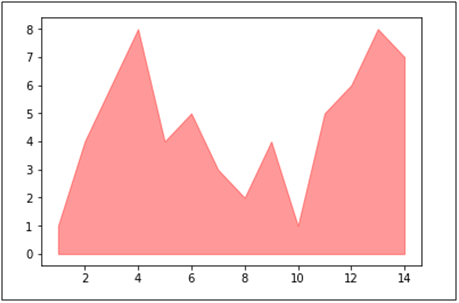 What are negative indexes and why are they used? 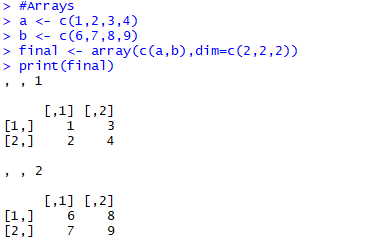 The sequences in Python are indexed and it consists of the positive as well as negative numbers. The numbers that are positive uses ‘0’ that is uses as first index and ‘1’ as the second index and the process goes on like that. 11. 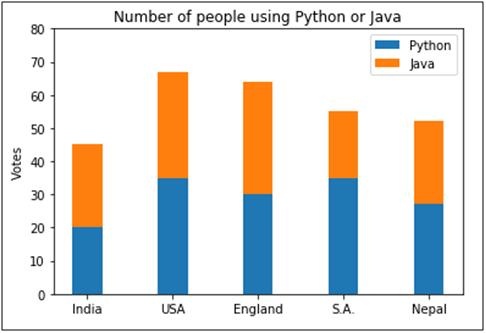 What are the supported data types in Python? 12. What is the function to reverse a list? 13. How to remove the last object from the list? Removes and returns last object or obj from list. 14. What is a dictionary? 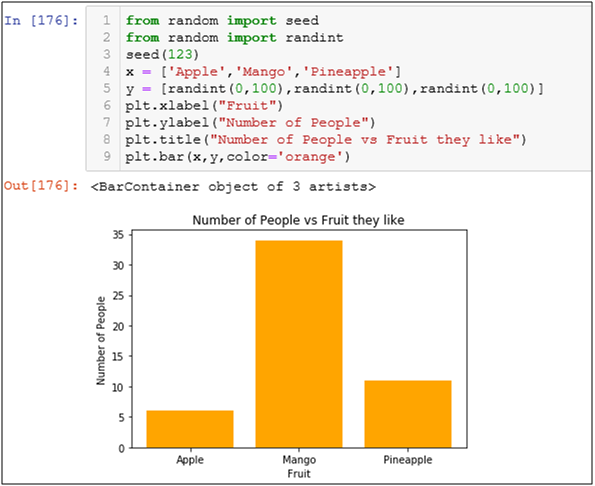 A dictionary is one of the built-in data types in Python. It defines an unordered mapping of unique keys to values. Dictionaries are indexed by keys, and the values can be any valid Python data type (even a user-defined class). Notably, dictionaries are mutable, which means they can be modified. A dictionary is created with curly braces and indexed using the square bracket notation. 15. Python is an object oriented language. What are the features of an object oriented programming language? Encapsulation, Data Abstraction, Inheritance, Polymorphism. 16. What is the difference between append() and extend() method? Both append() and extend() methods are the methods of list. These methods a re used to add the elements at the end of the list. append(element) – adds the given element at the end of the list which has called this method. extend(another-list) – adds the elements of another-list at the end of the list which is called the extend method. 17. Write a program to check if a string is a palindrome? 18. 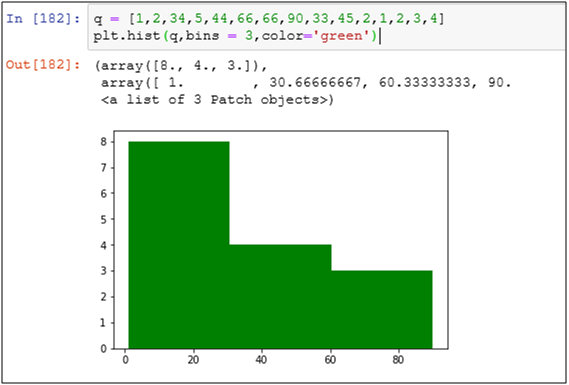 Take a random list and plot a histogram with 3 bins. 19. 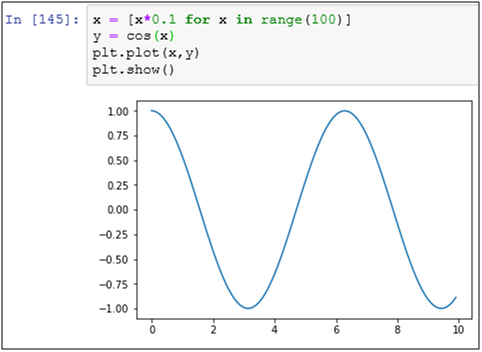 What is the different between range () and xrange () functions in Python? range () returns a list whereas xrange () returns an object that acts like an iterator for generating numbers on demand.